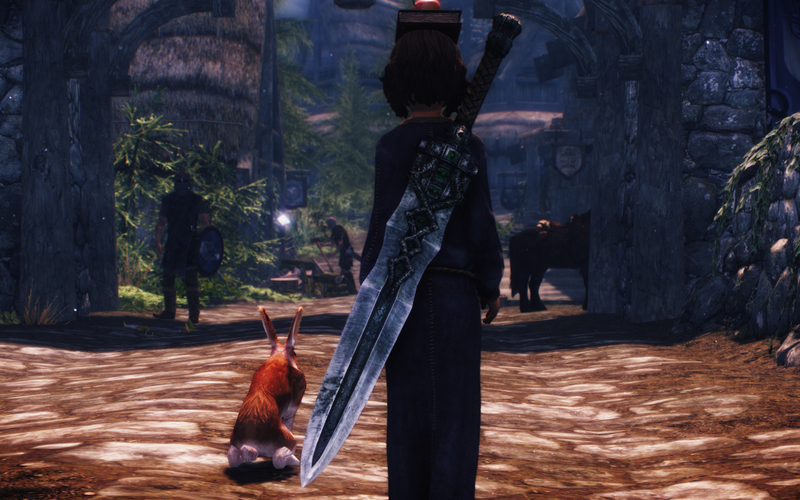 Here are the swords I ported for Oblivion a few months ago. I was thinking of bringing them into Skyrim along with other Dragon Age swords about three days ago but I started doing something else instead. Thanks to Eiries friend, I would probably have postponed porting them over and over if he hadn't asked me for them. I didn't really know how to port weapons. I tried once and failed. This time though, I could find a very complete, 4 parts video tutorial made by a German guy from Nexus forums. I followed his video step by step for the first sword and could easily do the second one by myself. Weapons never been something that interest me very much and I don't know much about them in game either. I never know what stats they should have and I wouldn't had stats myself because i'd probably make them over or underpowered. This is why I though I should just use Daedric weapon as a template for them since this is what I imagine people would use at higher level. Great Urukathek have same stats and crafting/tempering recipe as a Daedric Greatsword and Serpentie Elukana have the same as a Daedric Sword. This time I didn't make a dagger. I think it was unnecessary and the model isn't really fitting to be a dagger. To make them in game you can craft them the same way you would a daedric weapon. If crafting isn't your thing, you can still use console to create them. use help urukathek 4 and/or help elukana 4 to find their ID then use additem command. Naturally, All credits goes to CorvaenOboros for creating original model and textures. Funfact: Daedric greatsword have a HUGE collision box. If you drop it out of your inventory, it might fly away. Same thing happen to Great Urukathek since I used that sword for collision. Hey man I have all the models from vindictus. Would you be interested in helping me porting them into skyrim? I think it looks pretty dang beautiful! And based from the vanilla movement for the greatswords, it fits too! Are you sure weapons are not something that interest you..?